October 25, 2009 – NWPW: Austin Morrison defeated Gus Doe. December 6, 2009 – NWPW: Austin Morrison defeated Cedric Johnson. August 20, 2011 – Fit Pit Pro Fight Night: Austin Draven defeated Billy Blade. December 4, 2011 – NWA CWFH: M and W defeated Joey Kaos and Nick Madrid. December 24, 2011 – NWA CWFH: W defeated Hobo and Sergio Vega in a handicap dark match. January 12, 2012 – MPW: Austin Draven and Fern Owens defeated Jimi Mayhem and Ray Tanaka. February 12, 2012 – NWA CWFH: W defeated Joey Kaos by disqualification. April 7, 2012 – MPW: MPW world champion Bo Cooper defeated Austin Draven to retain the title. April 15, 2012 – Vendetta Pro: Vendetta Pro heavyweight champion Shannon Ballard defeated Austin Draven to retain the title. May 12, 2012 – MPW: Hector Canales defeated Austin Draven. June 10, 2012 – NWA CWFH: John Morrison defeated Austin Draven. From WWE.com: Some say he is disturbed, others say he is a genius, but if you asked him, he would simply say he is ahead of the curve. Judas Devlin is one of the more deranged, oddly intellectual NXT Superstars. Standing at 6’5” and covered in colorful tattoos, this modern day Aristocrat uses his intellect to confuse and break down his opponents mentally before ever stepping foot in the ring. The time has come for Devlin to realize his calling in the WWE Universe. With a sinister grin on his face, he wants to help NXT Superstars achieve their true wills and understand who they really are. He is convinced his purpose is to get in the collective heads of the WWE Universe and if that requires him to physically destroy every opponent in his path, he will gladly do so. August 1, 2012 – FCW: Corey Graves and Judas Devlin defeated Briley Pierce and CJ Parker. August 16, 2012 – NXT Live Event: Garrett Dylan defeated Judas Devlin. September 14, 2012 – NXT Live Event: Bo Dallas and Trent Barreta defeated Corey Graves and Judas Devlin. October 25, 2012 – NXT Live Event: Baron Corbin, Dante Dash and Memo Montenegro defeat Enzo Amore, Judas Devlin and Lincoln Broderick. November 30, 2012 – NXT Live Event: Mike Dalton defeated Judas Devlin. January 3, 2013 – NXT Live Event: Adrian Neville and Oliver Grey defeated Judas Devlin and Sawyer Fulton. January 17, 2013 – NXT Live Event: Judas Devlin defeated Denton Blackwell. February 24, 2013 – NXT Live Event: Derrick Bateman defeated Judas Devlin. February 28, 2013 – NXT Live Event: Danny Burch defeated Judas Devlin. March 7, 2013 – NXT Live Event: Sawyer Fulton defeated Judas Devlin. March 7, 2013 – NXT: NXT Tag Team Champion Adrian Neville defeated Judas Devlin & Scott Dawson in a non-title handicap match. May 9, 2013 – NXT Live Event: Conor O’Brian and Judas Devlin defeated Aiden English and Alexander Rusev. Judas Devlin was no longer with World Wrestling Entertainment. June 17, 2016 – MPW: Austin Draven defeated Ryan J. Morals. July 16, 2016 – MPW: Damien Sandow, Johnny Mundo and Seth Skyfire defeated Austin Draven, Briley Pierce and J Bronson. September 9, 2016 – MPW: El Quetzal vs. Just Judas ended in a no contest. September 16, 2016 – MPW: Just Judas defeated Hot Young Briley in a best 2 out of 3 falls match. September 23, 2016 – MPW: Danny Divine and Hot Young Briley defeated Daniel Moon and Just Judas. September 30, 2016 – MPW: Just Judas defeated Danny Divine to win the heavyweight title. October 15, 2016 – MPW: Danny Divine, Hot Young Briley and Seth Skyfire defeated Brad Maddox, Bronson and Just Judas in a steel cage match. October 21, 2016 – MPW: Just Judas defeated The Hobo. June 2, 2017 – VWE: Luchasaurus defeated Super Panda. July 4, 2017 – Bar Wrestling 2: The Killer Baes (Heather Monroe and Laura James) defeated Luchasaurus and Taya Valkyrie. August 12, 2017 – PWB: Garza Jr. and Laredo Kid defeated Chimera (Luchasaurus and Serpentico) & Angelico and Jack Evans in a 3-way tag team match to win the tag team titles. August 17, 2017 – Bar Wrestling 3: Trent defeated Luchasaurus. August 18, 2017 – MPW: Luchasaurus defeated Hector Canales. September 9, 2017 – CKCW: Team Storm (Jack Pollock and Jaxon Argos) defeated JD Smooth and Vibora. October 12, 2017 – Bar Wrestling 5: Brian Cage defeated Luchasaurus. October 27, 2017 – RPW: Super Panda defeated Luchasaurus. October 28, 2017 – REVOLVER: The Besties In The World (Davey Vega & Mat Fitchett) defeated The World’s Cutest Tag Team (Candice LeRae & Joey Ryan) and Zero Gravity (Brett Gakiya & CJ Esparza) and Alienated Youth (Trey Miguel & Zachary Wentz) and Chimera (Luchasaurus & Serpentico) in a 5-way tag team ladder match to win the vacant tag team titles. November 9, 2017 – Bar Wrestling 6: Team Big Brother (Austin Matelson and Jessie Godderz) defeated HATE (Peter Avalon and Ray Rosas). November 11, 2017 – CKCW: Vibora defeated JD Smooth. November 17, 2017 – HOH 34: Luchasaurus defeated Alex Reynolds. November 18, 2017 – HOH 35: Luchasaurus defeated Matt Riddle and Willie Mack in a 3-way match. December 14, 2017 – Bar Wrestling 7: Reno SCUM (Adam Thornstowe and Luster The Legend) defeated Luchasaurus and Super Panda. January 13, 2018 – MPW: Kevin Kross defeated Luchasaurus to retain the MPW title. January 18, 2018 – Bar Wrestling 8: Jeff Cobb defeated Luchasaurus. January 20, 2018 – IWR: Matt Sydal defeated Luchasaurus. January 26, 2018 – HOH 36: Willie Mack defeated Luchasaurus and Matt Cross in a 3-way match. February 3, 2018 – IWR: Montego Seeka defeated Luchasaurus. February 9, 2018 – MPW: Luchasaurus defeated Frankie Frank. February 16, 2018 – MPW: Frankie Frank defeated Luchasaurus. February 17, 2018 – ASW: Luchasaurus and The Thunder From Jalandhar defeated Adam Ryder and Nick Price to win the tag team titles. February 22, 2018 – Bar Wrestling 9: Luchasaurus defeated Suicide. May 9, 2018 – NHW: PPRay (Peter Avalon and Ray Rosas) defeated Luchasaurus and Super Panda. May 17, 2018 – Bar Wrestling 12: Luchasaurus, Super Panda and Taya Valkyrie defeated The Killer Baes (Heather Monroe & Laura James) and Kikutaro. June 28, 2018 – Bar Wrestling 13: Luchasaurus and Super Panda defeated Violence Unlimited (Brody King and Tyler Bateman), The RockNES Monsters (Johnny Yuma and Kevin Martenson) & Matt Knicks and Stevie Fierce in a 4-way tag team match. June 29, 2018 – MPW: Luchasaurus defeated B-Minus. July 11, 2018 – NHW: Luchasaurus defeated Hot Young Briley. July 20, 2018 – MPW: Peter Avalon defeated Luchasaurus by disqualification. July 25, 2018 – Bar Wrestling 15: The RockNES Monsters (Johnny Yuma and Kevin Martenson) defeated Luchasaurus and Super Panda. August 2, 2018 – Bar Wrestling 16: PJ Black and Taya Valkyrie defeated Luchasaurus and Super Panda. August 10, 2018 – Rogue Wrestling/WWEDM: Jeff Cobb defeated Luchasaurus in the 1st round. August 11, 2018 – MPW: Chris Bey defeated Luchasaurus to retain the MPW title. August 23, 2018 – Bar Wrestling 17: Doomfly (Delilah Doom and Eli Everfly) defeated Luchasaurus and Super Panda. August 25, 2018 – RPW: Doomfly (Delilah Doom and Eli Everfly) defeated The Stoner Brothers (Rick Scott Stoner and Scott Rick Stoner) & Luchasaurus and Super Panda in a 3-way, tag team semi-finals match. September 5, 2018 – NHW: B-Minus defeated Hot Young Briley and Luchasaurus in a 3-way match. September 13, 2018 – Bar Wrestling 19: Luchasaurus, Super Panda and Taya Valkyrie defeated Delilah Doom, Eric Watts and Scorpio Sky. October 13, 2018 – ROH TV (Taped): Luchasaurus defeated Hyperstreak in a dark match. October 17, 2018 – Bar Wrestling 21: PPRay (Peter Avalon & Ray Rosas), The RockNES Monsters (Johnny Yuma & Kevin Martenson) and Scorpio Sky defeated The Filip Brothers (Stevie Filip & Tome Filip), Violence Unlimited (Brody King & Tyler Bateman) and Luchasaurus. 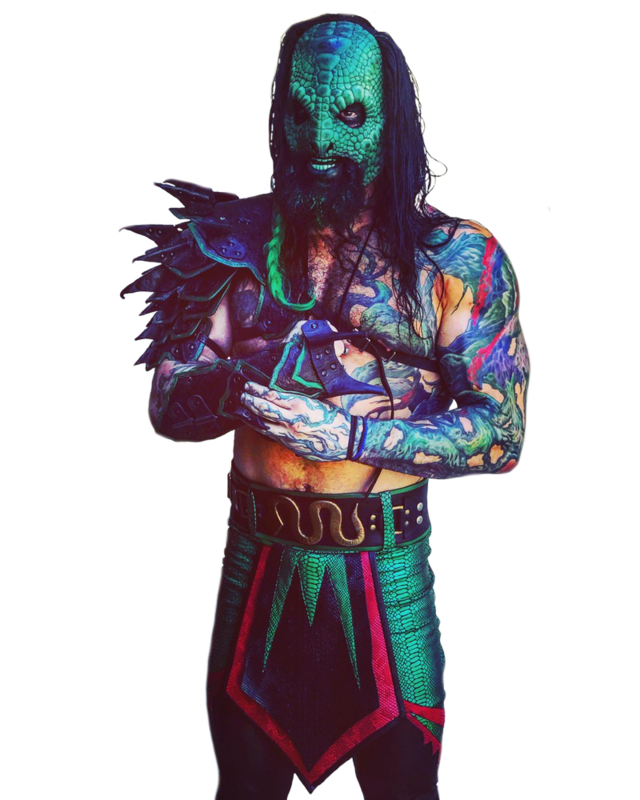 October 31, 2018 – Beyond It’s Alive: Josh Briggs defeated Luchasaurus. November 1, 2018 – Bar Wrestling 22: Luchasaurus defeated Douglas James. November 4, 2018 – ROH Survival Of The Fittest: PJ Black defeated Luchasaurus to qualify for the Survival Of The Fittest. November 23, 2018 – WrestleCade 4th Annual Showcase Of Champions: Billy Brash defeated Luchasaurus to retain the AML Prestige title. November 28, 2018 – Bar Wrestling 24: Killer Kross defeated Luchasaurus. December 5, 2018 – Bar Wrestling 25: Brian Cage and Luchasaurus defeated The RockNES Monsters (Johnny Yuma and Kevin Martenson). December 9, 2018 – IWF: Rey Horus and Satan defeated Black Destiny and Luchasaurus. December 19, 2018 – Bar Wrestling 26: PJ Black defeated Luchasaurus. December 31, 2018 – Bar Wrestling 27: Eric Watts, Luchasaurus and Tyler Bateman defeated Andy Brown, Brandon Cutler and Dave Dutra. January 5, 2019 – ROH TV (Taped): Jeff Cobb defeated Luchasaurus in a proving ground match. January 11, 2019 – WCPW: Tyler Bateman defeated Luchasaurus and RJ Santos in a 3-way match. January 13, 2019 – ROH Honor Reigns Supreme: The Kingdom (Matt Taven, TK O’Ryan and Vinny Marseglia) defeated Delirious, Luchasaurus and Shane Helms in a proving ground match. January 16, 2019 – Bar Wrestling 28: Tyler Bateman defeated Luchasaurus. January 20, 2019 – ASW: Bobby Sharp and Tyler James defeated Buck Lightning and Luchasaurus to win the tag team titles. February 15, 2019 – MPW: Luchasaurus defeated Charlie Mercer. February 20, 2019 – Bar Wrestling 30: High Risk Wrestling (Brandon Cutler, Delilah Doom and Eli Everfly) defeated Land Of The Lost (Jungle Boy, Luchasaurus and Solo Darling) in the 1st round. Hoping to see @JudasDraven booked for @HouseofHardcore in Philly @2300Arena! Dude is amazing and that entrance is no joke.